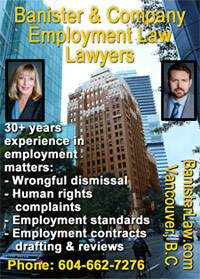 LAY PERSON'S SOURCE OF LAWYERS & DIFFERENT AREAS OF LAW IN B.C. Learn about the law in BC, with articles, FAQ's, and learn what legal fees to expect in different categories. To find free legal information or lawyers - choose an area of law. Use of this resource is subject to our site's terms and conditions. The BC Government amended the Insurance (Vehicle) Act and the Civil Resolution Tribunal Act. These amendments change the way ICBC claims are processed in this province. These changes will only affect injury claims for motor vehicle collision which occur on or after April 1, 2019. Sandra Banister, QC, has 30+ years experience to wrongful dismissal, employment contract drafting & reviews to her clients as well as her background in labour law. Rose Keith, over 25 years experience as a workplace lawyer, for Vancouver and BC clients, often as clients suffering from personal injury motor vehicle accidents. To help you find a lawyer in BC, we've compiled a list of lawyers from various directory research sources. Choose an area of law and location for a list of lawyers near you from the listings-information below. Lawyers in highlighted boxes have confirmed to us in writing that they meet the Law Society of BC's criteria for designating their practice area as a Preferred Area of Practice. * More about What is Civil Litigation? * More about Is it Worth-while to Sue? "B.C. consumers can't sign away class-action right - Supreme Court rules against clause in Telus service contract"
- [CBC News Posted: Mar 18, 2011 2:32 PM PT Last Updated: Mar 18, 2011 2:43 PM PT www.cbc.ca/news/canada/british-columbia/story/2011/03/18/bc-supreme-ruling-telus-class-action.html] ".... Canada's highest court ruled Friday that British Columbia consumers can pursue class action lawsuits even after signing contracts that appear to waive that right. Tips on hiring a lawyer + What's New? see also article on "The Steps in a Personal Injury Case"
How to start a class action in BC? What are the requirements for certification of a class action suit? What are the requirements for a representative plaintiff? What are the considerations for certification of a class action? see also Canada Private Investigators based in Winnipeg with cross country services. Buying & Selling a Business in BC Should I buy the assets or the shares of a company? Are there employee problems? Can I trust the other party? read What are the steps in a Medical Malpractice (law suit / litigation) case? The information provided on Lawyers-BC.Com is not intended to be legal advice, but merely conveys general information related to legal issues commonly encountered. Your access to and use of this Web site is subject to additional terms and conditions.